Penny postcards were the Twitter and Instagram of the early and mid-1900s – a quick and inexpensive way to share a pretty picture and let family and friends know where you were and what you were doing. 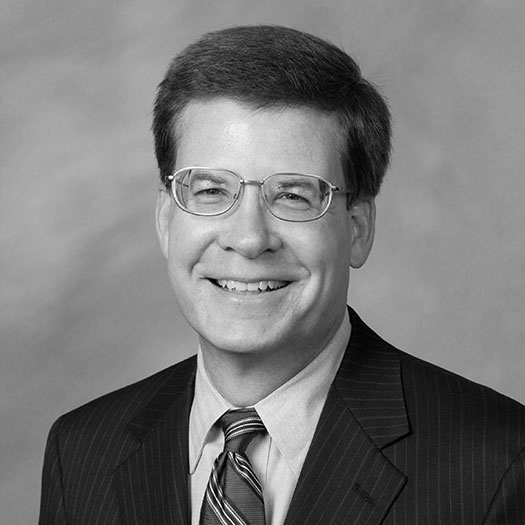 Web Alexander (’88), a development officer for the Wake Forest law and business schools, has been collecting vintage postcards for about 15 years. 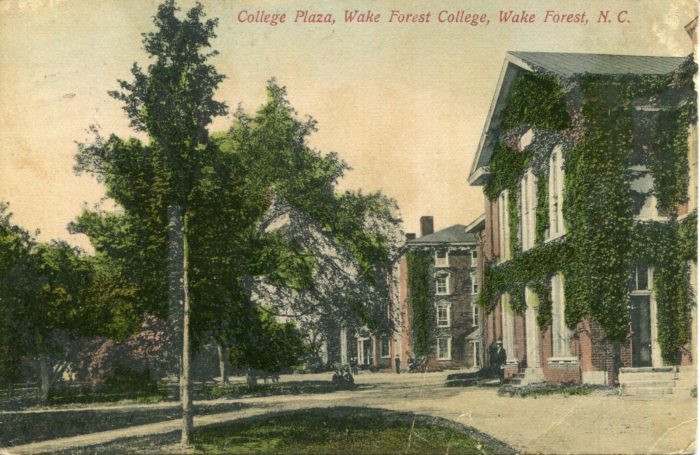 He has about three dozen postcards of the Old Campus dating back to the early 1900s. Some of the photographs were taken by pioneering female photographer Bayard Wootten. 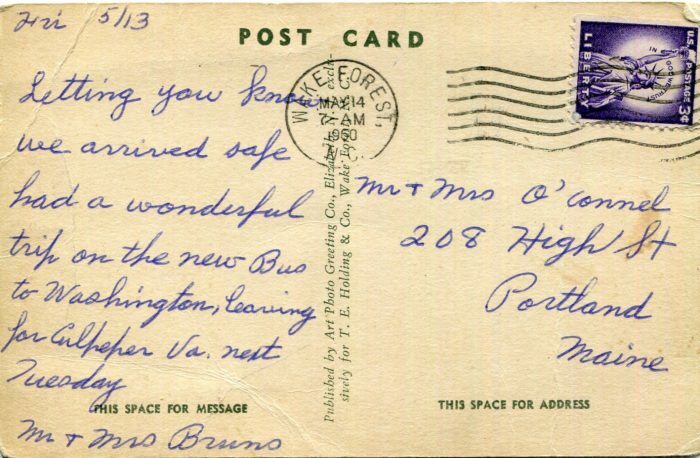 Back of Old Well postcard, mailed in 1960. 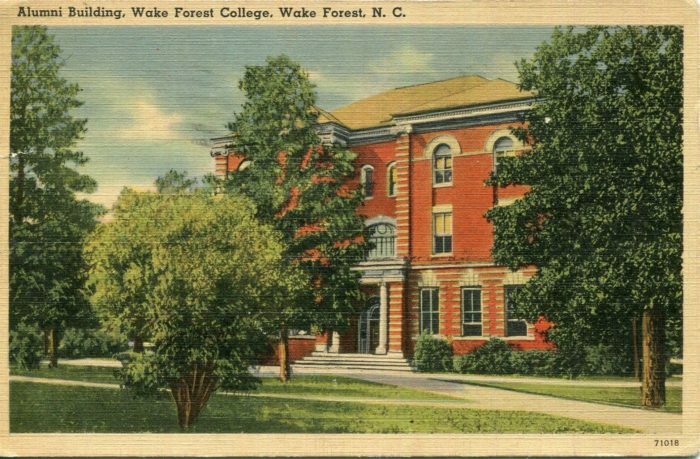 The postcards show a number of Old Campus buildings including Wait Hall, the Alumni Building, Lea Laboratory, and Hunter, Simmons and Bostwick dormitories. 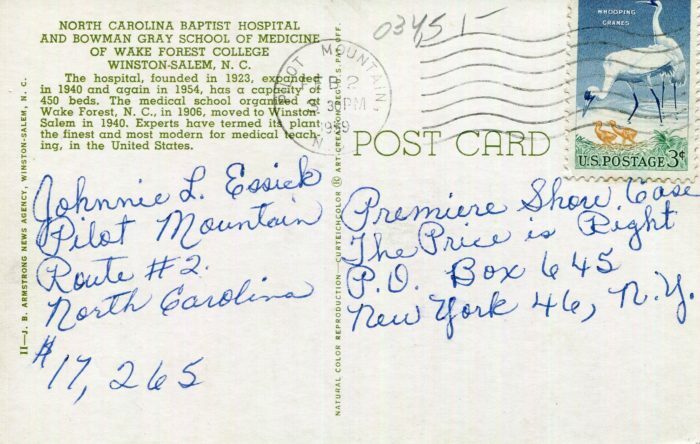 Other postcards show N.C. Baptist Hospital/Bowman Gray School of Medicine in the 1940s and ’50s, and Bowman Gray Stadium, Wake Forest’s home football field in Winston-Salem until Groves Stadium/BB&T Field was built. About half the cards are in black and white, while the others have been colorized. 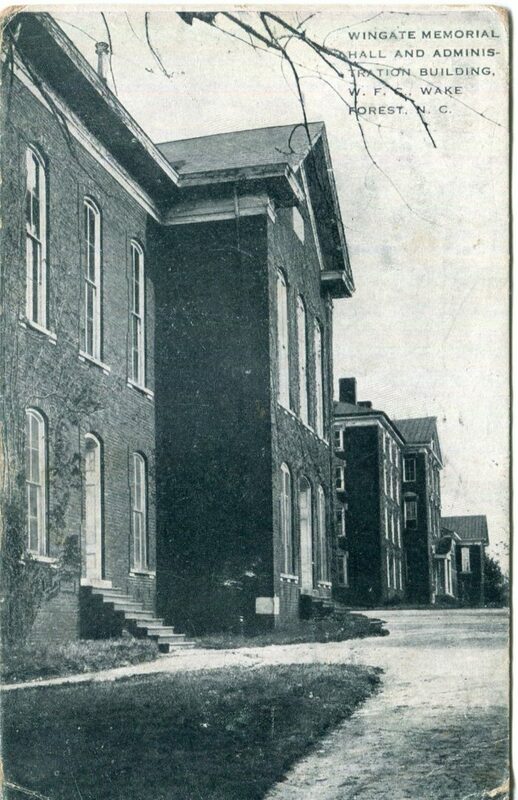 Back of the Alumni Building postcard, mailed in 1955. 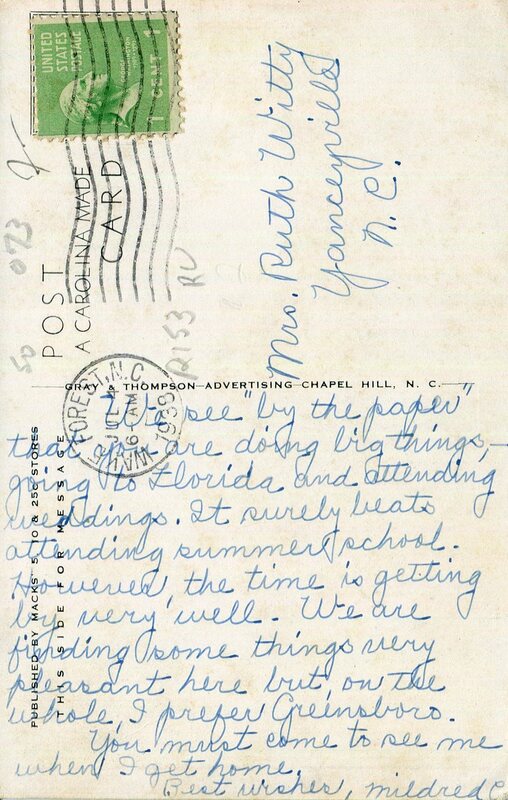 The postcards were likely originally sold at drugstores — T.E. Holding Drug, Hardwick’s Drug Store, Power’s Drug Store (later Hardwicks) and Edwards Pharmacy — in downtown Wake Forest. Others were sold at Macks 5, 10, 25c Stores. 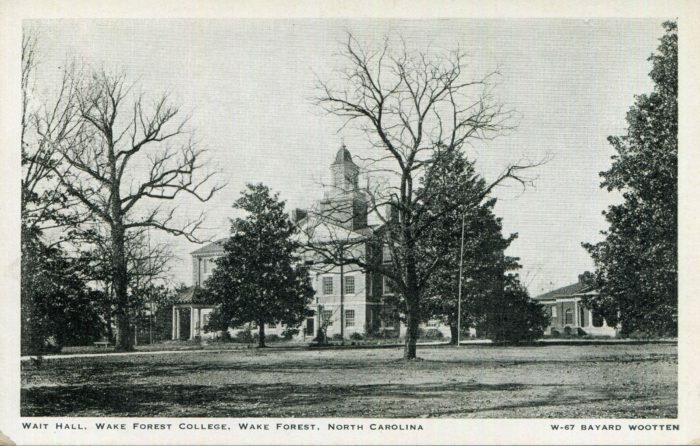 Students and town residents, as well as visitors to Wake Forest, could easily pick up a postcard to mail to the folks back home. Some of Alexander’s cards were never mailed. 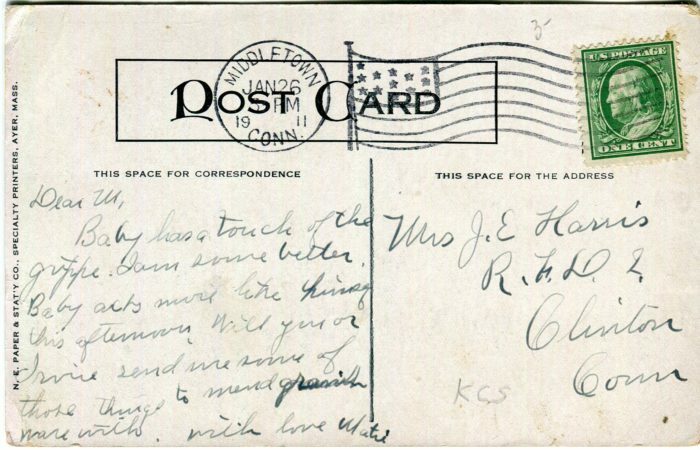 Others have interesting messages on the back that leave you speculating who the senders and recipients were. Several postcards feature photographs by Bayard Wootten, one of the South’s most important early female photographers. 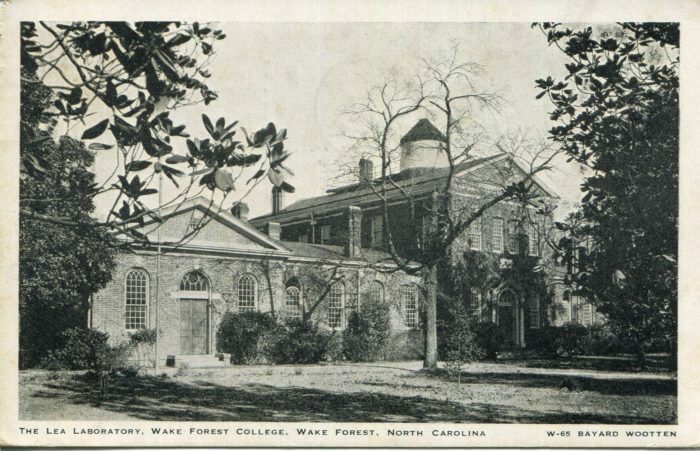 A native of New Bern, North Carolina, she focused on commercial photography for postcards early in her career before becoming more established and opening a studio in Chapel Hill. She later became well known for her striking artistic style and for her photographs of Charleston, South Carolina; the North Carolina mountains; and of poor, rural people during the Great Depression. She’s thought to be the first female photographer to take aerial photographs, made in 1914 from a Wright Brothers Model B airplane. Wootten’s life was chronicled in a 1998 biography “Light and Air.” She died in 1959. Wait Hall, the administration building, photographed by Bayard Wootten. 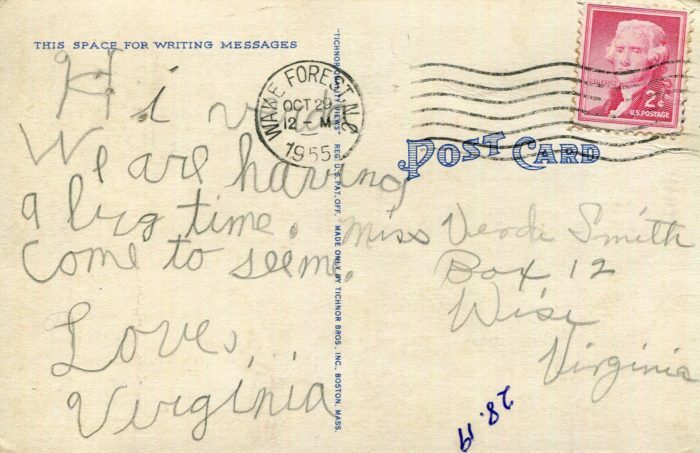 Beginning in 1907, the backs of postcards were divided into two sections — the right half for the address and the left half for messages. Most early postcards were printed in Germany and featured images that covered the entire card. 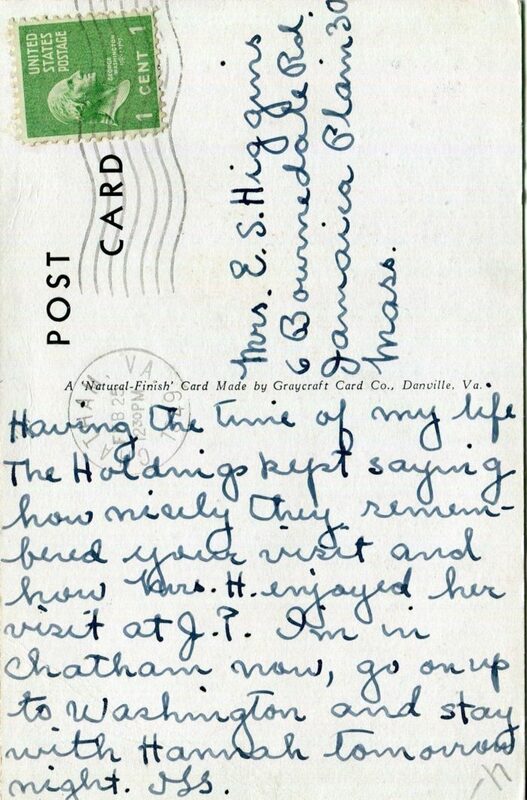 During World War I, American printers began making postcards, but saved ink by not printing to the edge of the card, instead leaving a white border around the photograph. Colorized cards were introduced in the 1930s. 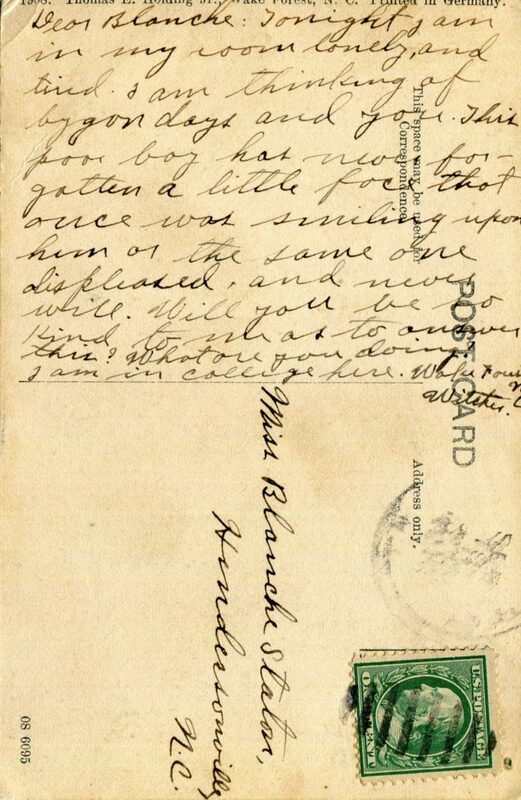 Alexander's oldest card was mailed in 1905. 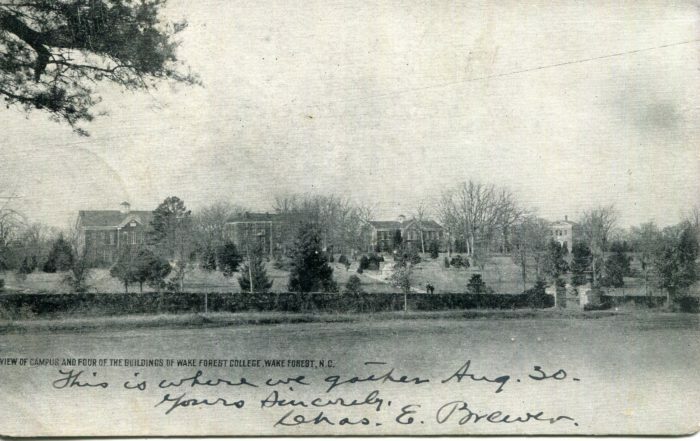 The reverse side was for the address, so Charles Brewer (1886) wrote a short message on the picture. 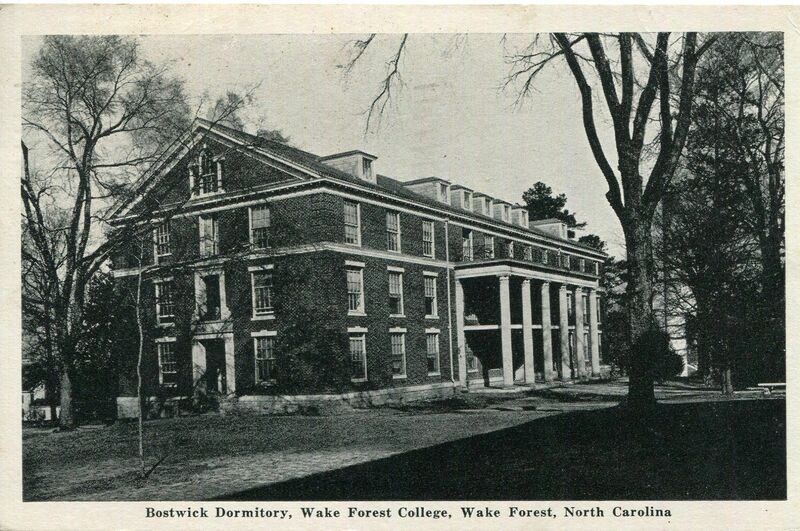 Back of the Bostwick Dormitory postcard, mailed in 1949. 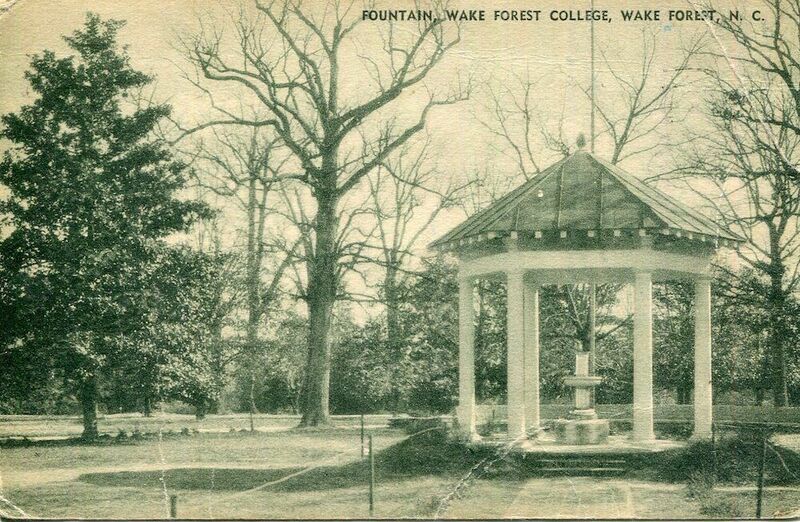 Back of the Wingate Hall postcard, mailed in 1911. Lea Laboratory, photographed by Bayard Wootten. 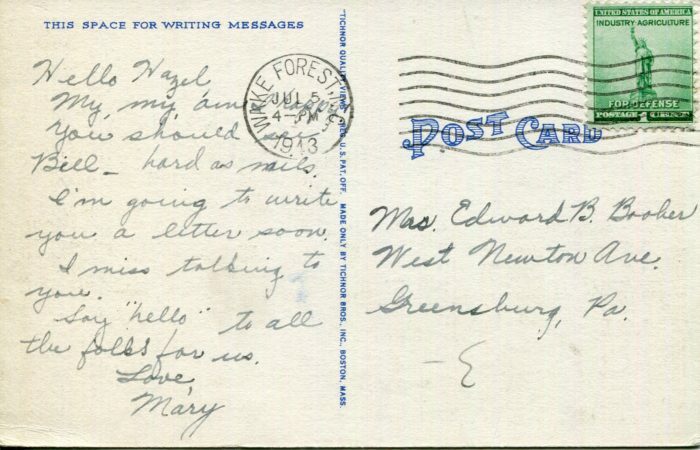 Back of the Lea Laboratory postcard, mailed in 1938. 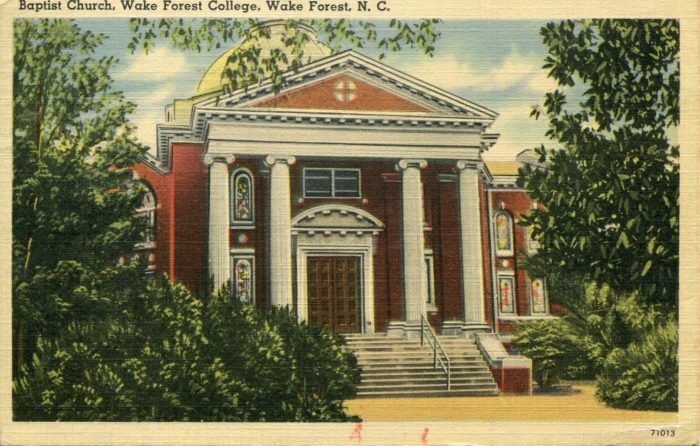 Back of the Wake Forest Baptist Church postcard, mailed in 1943. 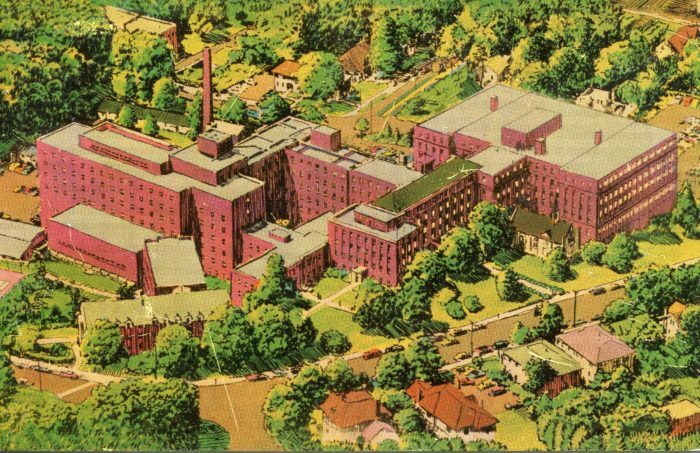 Back of the Baptist Hospital postcard, mailed in 1959.